If you are looking for a secure virtual data room for your M&A transaction or you are looking for a system to manage confidential information in a large collaborative project, then look no further than Document Vault. Mergers & Acquisitions for carrying out due diligence on an M&A deal - providing a secure environment in which members of the Seller organisation can disclose information about a particular company or asset for sale to one or more Buyers, secure in the knowledge that only authorised individuals can access the data. Corporate Information System for managing confidential information on large collaborative projects - providing secure access to company-wide information, 24/7, regardless of location. Ideal for company intranet, and companies with a large number of remote workers & home workers. Document Archive - providing access to historical documents such as employee records, accounts records etc. Document Vault Systems specialise in secure virtual data room solutions. Our clients include law firms, investment brokers, insurance companies, property companies (real estate), oil and gas firms, mining companies, solar energy companies, together with public sector organisations. We have been providing virtual data room technology since 2006. All our data rooms are hosted in UK-based ISO 9001, ISO 27001 certified data centres. All documents are encrypted at rest using 256-bit encryption and encrypted during transfer by 256-bit SSL encryption. Access is given to authorised users only. Permission-based controls give you full control over who can see which documents in the dataroom. The system provides a full audit trail of all documents viewed/downloaded on a person by person basis. We offer 99.9% guaranteed uptime as we run multiple servers mirrored to each other, located in the UK. Document Vault is secure, easy to use and accessible from anywhere in the world 24 hours a day, 7 days a week. 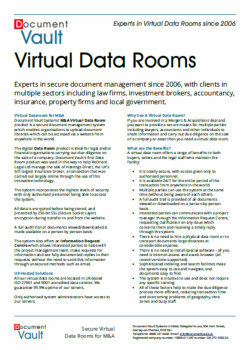 For further information about our virtual data room solutions, download our product brochure. We offer same day setup to our clients and offer full support and training as and when necessary. Your sensitive business documents are secured and accessed only by authorised people, who you decide. If you want a secure data room which is easy to use, look no further. Call us on 0808 221 0440 or complete the online form to tell us about your needs. Our friendly team will be happy to help.